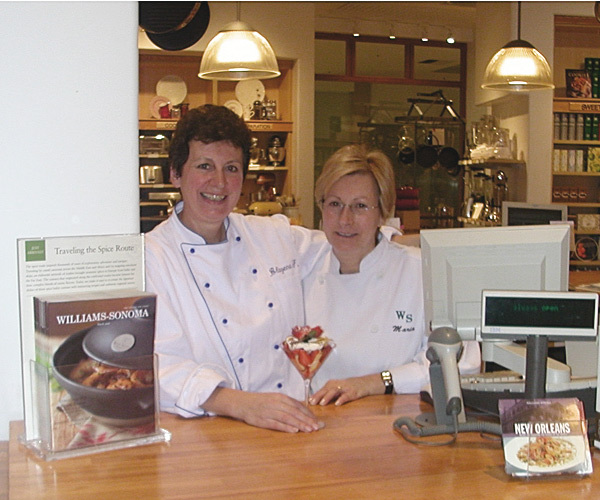 These classes taught by Chef Blažena at Williams Sonoma were a total success! Now, you can enjoy them in the comfort and privacy of your home or at a rented venue in the Bergen County. Classes are scheduled by appointment and can be demo, participation or interactive, as you desire. Round up a few friends and let's have some fun, learn new things and enjoy good food. Any of the menus below I have demostrated at Williams Sonoma can be given in your home or in the inviting and unique MAVERICK Cooking Studio. The cooking events are available by appointment, during the day, evenings or on weekends (slight surcharge for Saturday evenings). - Participation cooking class for about 3 hours. Learn through hands-on experience! Daikon-Carrot-Ginger Salad has a clean, refreshing taste and can be enjoyed either as a light starter or a side dish. Braised Chicken with Shallots, Garlic and Balsamic Vinegar Sauce. Discover how only a few ingredients deliver a rich flavor. Sautéed in bacon, this is a simple yet hearty dish, satisfying every appetite. Green Beans Bacon Bundles are sprinkled with “secret” spices (you’ll know!) and oven baked. Another yummy side veggie to fall in love with! Strawberry Parfait is a stylish, simple fresh fruit dessert, always successful and delicious finale to your dinner. Balsamic Baby Spinach Salad with Strawberry, Pignoli Nuts and Gorgonzola Delicate, tender salad offering tasty and exciting blend of “sweet fruit and green” flavors. Simply excellent! Spring Ginger-Carrot Soup is well-rounded, balanced soup, which combines the flavors of sweet carrots with tangy ginger in a chicken broth. A great spring entrée starter! Asperges au Printemps Asparagus, the ultimate herald of spring - laced with European Vinaigrette dressing with Chives. Elegant Brie Tartlets with Piquant Conserve easy and sophisticated appetizer, so suitable for countless variations! Chef Blažena will give you plenty of how-to ideas! Balsamic Boneless Chicken with Golden Raisins and Lemon Zest in White Wine-Tarragon Marinade on a bed of Arugula -fantastic way to prepare chicken that combines the subtle sweetness of balsamic vinegar with golden raisins and lemon zest. Sautéed in white wine-tarragon marinade and served on a bed of Arugula and Romaine leaves is a favorite in French and Italian bistro alike, as it will be in your home! Barley Salad-lightly sweet, nutty flavor of this superb grain salad is a delicious and healthy surprise. This salad makes you a ‘barley lover’ should you still be such candidate! Pêaches Cardinal (Peaches) drizzled with Raspberry coulis, served with a scoop of Vanilla Ice cream (optional). Outstanding and simple! Let’s take a culinary trip South of the Border and overseas, to Spain, where Tapas Bars are the art in "noshing"! As the weather gets warmer and the sun smiles on us, we feel inspired to invite friends over for a little something! Learn how to prepare a few fabulous morsels and entertain your guests with a “sizzle”! Albondigas in Tangy Tequila Sauce this impossibly ‘retro’ dish (cocktail meatballs) is a crowd pleaser! The hot Italian sausage meat & beef meatballs are “spiced up” with the flavors of orange, lime, hot pepper jelly and, of course, tequila. While serving it might not necessarily earn you a call from the Gourmet magazine, your guests will want a copy of this recipe – pronto! Tropical Fruit Salad Borracho ’drunken’ Fruit Salad is a luscious blend of fresh mango, pineapple, papaya, star fruit and such, laced with tequila-lime dressing and garnished with (possibly fresh) coconut shavings. Great to clean the palate after our spicy tapas! Manzana Sangría since we can not serve alcoholic drinks, we’ll taste this virgin sparkling apple juice version. Chef Blažena will teach you ‘the drift’ and you can add your tequila or wine to this recipe at home. Summer is around the corner! Parties are planned! The backyards beckon to celebrate with Dad, family or friends. This hearty recipe collection will satisfy substantial appetites! Roasted BBQ Rosemary Garlic New Potatoes real food for real men! Robust, easy, delicious to roast on the grill. An outstanding favorite at any BBQ party. Forget the potato salad at this gathering! Anytime is the right time for French Cuisine:) Chef Blažena offers a delicieux collection of French Cooking classes as below and beyond. Coq au Vin Blanc Blažena’s visually pleasing adaptation of the famous dish, modified with a white wine, adds a delicious twist on the quintessential “plat du jour” fare served all over France and the world. The class will be rounded up enjoying a glass of virgin Kir, transporting you miles away…..! Chef Blažena will demonstrate how to put ‘French twist’ on abundant ingredients from our Garden State and create vibrant flavors of Provence. Provençal Potato Salad with Shallots and Sherry Vinaigrette is so easy to prepare and is an absolute winner any time. Great to bring along to any BBQ party. Fraises aux Crème Fresh Strawberries and Fruits with special Marshmallow Dip.... Oh la, la! description under French Series in the Maverick Cooking section (Link below), or e-mail the chef if you are interested in this menu. Grilled Gourmet Chicken Roulades with Wine Butter Sauce this mushroom stuffed chicken breast is a true and delectable recipe for entertaining! BBQ Pineapple juicy fresh pineapple, marinated with sweet spices and ginger, delivers an exotic and terrifically tasting touch to your outdoor party menu! In the two classes “Fall Outings,” you will learn to prepare delightful fare with international flair, perfectly suitable for a picnic, sport event or a fall hike in the mountains. Pack up these delectable recipes, a bottle of Merlot or Bordeaux, along with a blanket and take off for a nice weekend hike and enjoy the Indian summer. Or, maybe you’d prefer to call a group of friends and set a stage for a tailgate picnic? Learn the simple techniques and sample mouth-watering collection of a variety of hot and cold appetizers to pamper your family and welcome your friends – or to make for just nibbling on any time, holiday season or not! And Voilà! Now, let's celebrate and enjoy life. As the holiday season nears, don’t panic! We will tackle a few holiday-do-ahead delectables, suitable for entertainment, which leave you time to enjoy your company. Tantalizing, yet uncomplicated fare will please your palate and impress your guests. Compliments will abound! More classes open to public are frequently added, please call me or visit my website soon again for the latest update. Private Culinary Classes "COOKING WITH FRIENDS"
Lessons are available either in your home or off-site, per your desired schedule. For ideas, click on the link below, or, of course, I will gladly customize menu accordingly to what you like to eat and want to learn to cook. Happy Cooking, Happy Eating! Remember, that life is short and every day is a fête!